Bing Ads shows you how competitive your ads are in the marketplace by measuring how relevant your keywords, ads, and landing pages are to customers' search queries and other input. 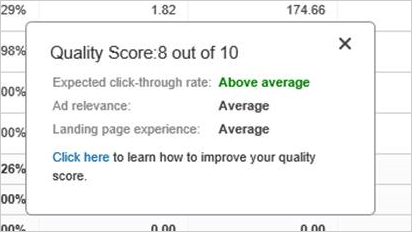 You can find your PPC quality scores in your Performance Reports and in your Keywords list. You can also get reporting on low-quality clicks, click fraud, and invalid clicks. Recognize how Bing Ads categorizes clicks. View your keyword quality score. Find out your impression share. Troubleshoot why your ad isn’t displaying. Each time your ad is clicked, Bing Ads categorizes the click as either a standard-quality click, a low-quality click, or an invalid click. Standard-quality: Clicks that have the highest potential to drive customer awareness of your business and boost your conversion rate. Low-quality: Clicks that exhibit a low likelihood of commercial intent and rarely result in conversions or value to your business. Invalid: Clicks that fall into the low-quality category which exhibit characteristics of user error, search engine robots, spiders, test servers, questionable sources, or fraudulent activity. You are billed for standard-quality clicks, and should not be billed for low-quality or invalid clicks. You can run different performance reports to help you identify low-quality clicks, invalid clicks, and click fraud. Each Bing Ads report contains a subset of attributes and statistics, displayed in a column. Clicks: the number of clicks or other user input on any clickable element of your ad, including the ad title, display URL or phone number. Click Call: the number of clicks on a clickable Call Extension phone number. This includes clicks on metered (call forwarding) and non-metered phone numbers. Click share: the percentage of clicks that went to your ads. It is the share of the prospective customer's mindshare and buying intent you captured. Conversion rate (%): the number of conversions, divided by the total number of clicks. Low-quality click conversion rate (%): the conversion rate of clicks that originate from low-quality clicks. Low-quality click conversions: Conversions that originate from low-quality clicks. Low-quality click rate (%): The number of low-quality clicks, divided by the total number of clicks. Low-quality clicks: Clicks that exhibit a low likelihood of commercial intent and for which customers are not billed. After you run a report, you can customize its layout by rearranging the attributes and performance statistics or by filtering out unwanted data. To understand where your business’s high performing traffic comes from, you may also need to exclude certain websites from the Bing Ads Syndicated Partner Network. You can find out what those are by accessing the Website URL (publisher) report on the Reports page. Much like click-through rate is a percentage of impressions resulting in a click, conversion rate is the percentage of ad clicks that result in a conversion; for example, a purchase or a registration. A sudden change in your conversion rate could mean an increase in low-quality and invalid clicks. Using conversion tracking and Bing Ads Universal Event Tracking makes it possible to analyze the number of clicks your ads are getting and the number of conversions being generated. You can use your quality score to determine the best ways to optimize your keywords, ads and landing pages to help improve your ROI. The expected click-through rate score reflects how likely your ads will be clicked and how well your keyword competes against other keywords targeting the same traffic. This score predicts whether your keyword is likely to lead to a click on your ads, taking into account how well your keyword has performed in the past relative to your ad's position. A score of 3 is Above Average; a score of 2 is Average; and a score of 1 is considered Below Average. The ad relevance score indicates how relevant your ad and landing page are to the customer's search query or other input. A score of 3 is Above Average; a score of 2 is Average; and a score of 1 is considered Below Average. The landing page experience score describes whether your landing page is likely to provide a good experience to customers who click your ad and land on your website. It is based on how many times customers leave your ad's landing page shortly after arriving. A score of 3 is Above Average; a score of 2 is Average; and a score of 1 is considered Below Average. If two of the three components are Above Average, most likely your score will be 7 or above. This means the keyword is very competitive in the marketplace. The keyword is underperforming in the marketplace - so your ads are less likely to appear on the Bing Network when that keyword is matched. If one or more of the three components of quality score are Below Average, most likely your score will be 5 or below. If you want to improve your quality score, you need to make changes to improve the poor performing component. The keyword is competitive - but no better than average compared to other keywords targeting the same traffic. If all three components are Average, or a combination of Average and Above Average, most likely your score will be 6 or higher. 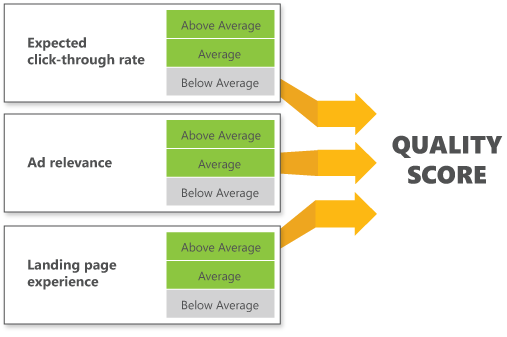 If you want to improve your quality score, you need to make changes to get all three components to Above Average. The keyword is very competitive in the marketplace, and its CTR is higher than the average CTR of keywords targeting the same traffic. If all three components are Above Average, most likely your score will be 7 or above. Bing Ads has created enhancements that will lead to a more consistent experience across our Campaigns grid and reporting experiences, expanding the number of keywords that will have a quality score. For keywords that were not servable during the last 30 days of a reporting period, a ‘-’ will be shown as the quality score value. The Reports page and Reporting API enable customers to view historical quality scores across their keywords for reporting periods where they meet the servable requirement. You can now take action on your quality score knowing that they are displayed as empty (or ‘–‘) values in the Campaigns grid for keywords that were not servable in the last 30 days. Note: Quality score is updated every day, so changes to any of the components can impact your quality score. Read more about improving your overall score. Keywords with scores of Above Average or Average, are eligible to serve ads on Bing and Yahoo search results pages. Keywords with scores Below Average with have limited eligibility to serve ads in search queries. The quality score can range from 1 to 10, with 10 being the highest. You can see the quality score on the Keywords, Campaigns, and Ad Groups tabs on the Campaigns page. To view your keyword quality score, click Campaigns at the top of the page. Click the Keywords tab. Click Columns and select the Qual. score column if it isn't already in the table. The Qual. score column displays the score for each keyword. Click the arrow to the right of the quality score to see the ratings for each performance. You can use the historic quality score options in Reports to review historic averages as far as 18 months from the current date. To view your historic quality score, click Reports at the top of the page. Click the Keywords performance report. To view historic quality scores at the campaign or ad group level, select the Campaign or Ad group performance report. You can select specific campaigns or ad groups in the What to report on list. Select Day as the unit of time. In the Choose your columns section, select Historic quality score and any other historic attributes you want. Click Run. Remember, Bing Ads now generates quality scores for all keywords that were servable in the last 30 days. For a keyword to be considered servable during the last 30 days, it would need to have been active (or not paused) as well as editorially approved to serve. Valid payment method: Bing Ads requires a payment method on file before your ads can display. For info on payment methods, see What are my billing options? Enabled status: Ads won't run if the related campaign, ad group, or keywords are not enabled. For information on changing their status, see How to change your status, bid, and other settings. Issue with a keyword: Check the Delivery status of your keywords on the Keywords tab. If a keyword's status is anything but Eligible, click the ellipsis icon next to the status for an explanation of the problem and how to fix it. Editorial review: Offers from your catalog are typically processed within 48 hours after we receive the feed. However, if you wait to create your product ad campaign until the feed is approved, that can take another 24 hours for the ads to be eligible to be served. Different ad position: Changes by your competitors to their bids could be affecting your ad position, for example, causing your ad to drop to another search results page. See What is "ad position?" to learn more. Budget issues: Ads stop running when your campaign budget is depleted. For example, if you're using the daily budget option and you deplete your budget in the middle of the day, that's when your ad will stop running. For more info, see What are my budget options? Targeting: If you have scheduled your ad to run only on certain hours of the day or days of the week, you may be looking for your ad at the wrong time. For more info, see How can I get my ads in front of my customers? Lastly, if your ad group is targeted to specific geographical locations, times of day, or other target settings, you need to search using those same settings. For info on improving your ad position, see Get my ad to the top of the search results page. Your impression share lets you know many impressions you’re capturing in the auctions you’re competing in. Use this data to view the percentage of impression share (%) you have in the marketplace, find out if you are missing opportunities based on your current campaign settings, and make changes to improve impression share. The estimated percentage of impressions, out of the total available impressions in the market you were targeting. Example: Out of estimated 59,000 impressions that occurred on this day in your targeted market, you got only about 2,300, or 3%. The estimated percentage of impressions your ad did not receive due to issues with your daily budget. The estimated percentage of impressions your ad did not receive due to issues with your keyword bids. Example: Your keyword bids are low, and not competing well in the auction marketplace. The estimated percentage of impressions your ad did not receive due to issues with your ad ranking. The estimated percentage of impressions your ad did not receive due to issues with ad relevance scores. To learn more about ad relevance, a component of the quality score, see Quality score in depth. The estimated percentage of impressions your ad did not receive due to issues with expected click-through rate. To learn more about expected click-through rate, a component of the quality score, see Quality score in depth. The estimated percentage of clicks, out of the total number of clicks in the market you were targeting. Example: Out of the estimated 1,000 clicks that occurred on this day in your targeted market, you had about 230, or 23%. The estimated percentage of impressions that your campaign received for searches that exactly matched your keyword, out of the total available exact match impressions you were eligible to receive. You can use the Bing Ads share of voice report for statistics about the percentage of ad impressions and clicks you may be losing. The report shows impression and click share information for account, campaign, ad group, and keyword performance. To create a share of voice report, click Reports. If not already expanded, click Standard reports. Click Performance, and then click Share of voice. Select the unit of time (Show (unit of time)), Date range, and the download Format you want. Click Run to run the report, or Download to download the report as a CSV or TSV file. You can add competitive metrics columns in the Accounts Summary page, and Campaign, Ad Group, or Keyword grids. Go to the Accounts Summary page, or Campaign, Ad Group, or Keyword grids. Click Columns to open the column chooser. Select the Competitive (Share of Voice) section. Choose any of the columns to add. Click Apply. Read more about what impression share data to include in your report. The overall ad quality score calculation includes values from a range of factors, including keyword and landing page relevance, as well as click-through rate performance. Track your historic quality score in performance reports to monitor changes in your quality score over time. Use share of voice reports to analyze impression share, make bid adjustments, and monitor click quality. Use Bing web resources to troubleshoot why your ads aren’t displaying. Thanks for reading this training on quality advertising experiences. Continue your training or take the Bing Ads Accredited Professional exam to become accredited.